Pieter Geldenhuys is a renowned Futurist, Academic and Innovation expert. He has a degree in Electronic Engineering, an MBA specialising in Technology Strategy and is currently busy with a PhD thesis in Innovation Management. He has recently been commissioned to create a new TV series entitled “2025”. 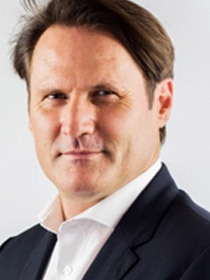 He was a Technology Strategy advisor to the CEO of Vodacom between 2005 and 2011, and the previous Vice-Chair of the Innovation Focus Group at the International Telecommunication Union in Geneva, Switzerland. He is currently a guest lecturer at the world famous Cornell University, Ithaca, New York. Pieter Geldenhuys is known on the speaking circuit as the “Tour guide to the Future”. He is the Founder and Director of the Institute for Technology Strategy and Innovation at North-West University. Over the past decade, he has guided more than 3000 students and more than 100 innovation projects within South Africa’s largest technology companies. He is adjunct faculty at WITS, GIBS, Duke and Cornell University. He has developed 7 post-graduate University accredited training programmes in the Telecommunication and ICT field since 2004. As an academic, he was honoured in 2014 with a nomination to the prestigious South African Academy of Science and Arts. He has more than 1000 public appearances under his belt, and has spoken to audiences in more than 20 countries. As a matter of interest, he was one of five global Futurists that contributed to the Future Optimism report in Vodaphone’s recent rebranding strategy.